In 1996, child beauty pageant winner JonBenet Ramsey was killed at the age of six. This murder mystery is still unsolved, causing theorists to believe that JonBenet was not killed that night, but was instead kidnapped by the Illuminati, her parents staged her death, and she later resurfaced as Katy Perry in 2008 with her hit single “I Kissed A Girl”. 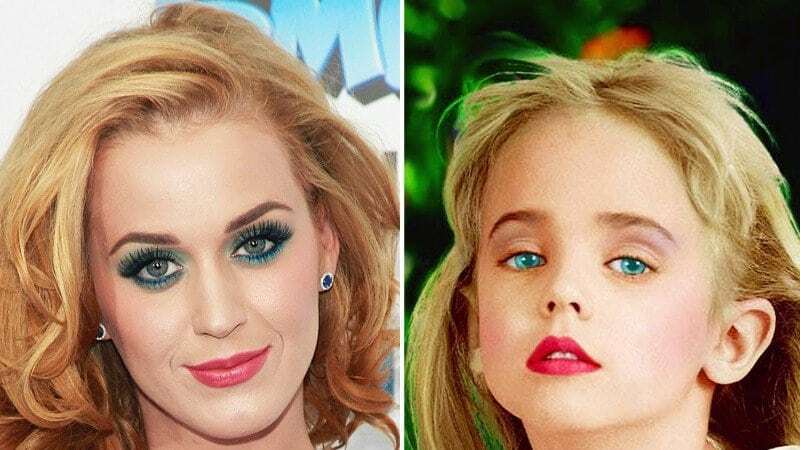 This idea rooted from a YouTube video in 2014, titled “JonBenet Ramsey is singer Katy Perry”, quickly gaining popularity, resulting in many copycat videos and even being covered by Entertainment News. The evidence is the striking resemblance between the two girls as well as their parents. Because of this growing theory, fans were amused when Katy Perry referenced JonBenet Ramsey in her memoir, saying “Not that I was one of those stage kids. There was no JonBenét Ramsey inside of me waiting to burst out.” This gave fans further proof of this theory because we all know that the Illuminati loves to leave clues about their secrets.